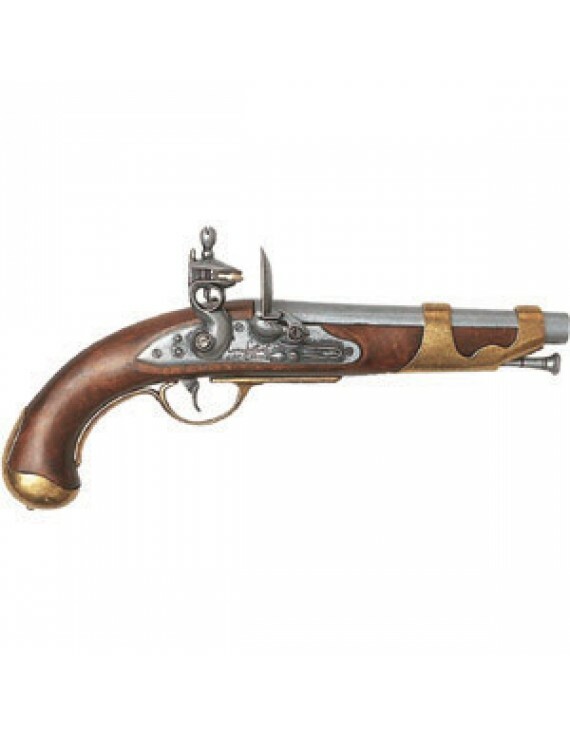 Flintlock pistols were so called because the lock uses a flint to strike sparks into the priming pan when the trigger is pulled. A small amount of gunpowder in this pan is ignited, which in turn ignites the main gunpowder charge in the barrel, firing the lead ball. Both the main charge and the ball were loaded from the front, or muzzle, of the barrel, after which the priming charge was poured into the pan ? all very time consuming! Often the priming charge would burn but fail to ignite the main charge ? whence the expression flash in the pan! The original of this particular flintlock pistol was made for the French cavalry at the end of the 18th century. This non-firing version is accurately detailed - a great re-enactment or conversation piece.